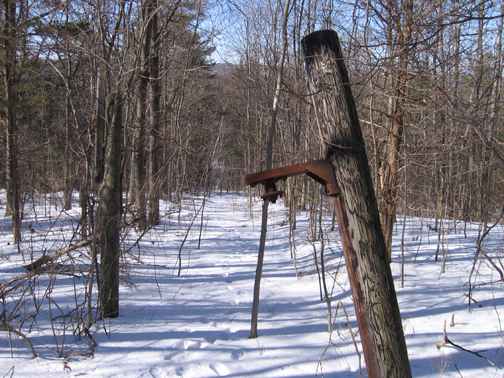 "Saint Marks School owned this ski area. Long since abandoned. 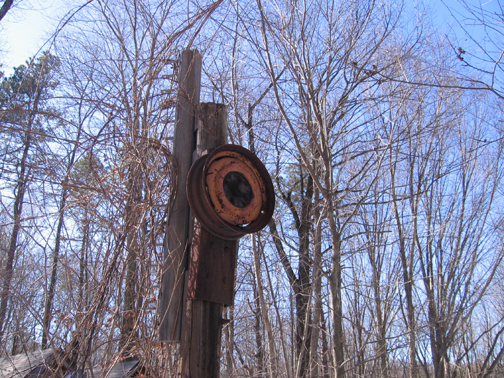 It is located a mile away from Private Property No Trespassing Keep Out Ski Area." The tow was a private one, ran by the school, with one fall line slope. 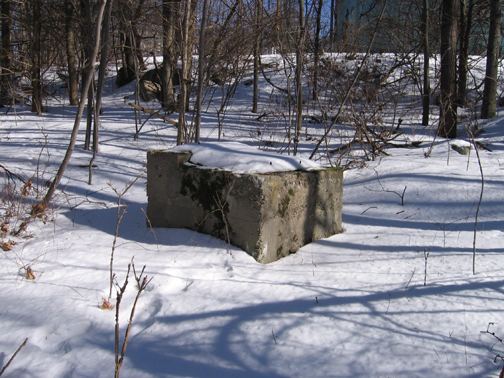 The tow was installed in 1964 or 1965 by Mackin Pulsifer and students, including Richard Davisson. The area had a 170' vertical drop, with an approximately 800' long rope tow. Like many private areas, this one closed before 1971, most likely due to liability reasons. Today, the area has grown in quite a lot, as this 1995 USGS aerial image indicates. Note the water tower - pictures of this in 2006-2007 are below. M. Curtin: "My brother went to St. Mark's in the early 70s, and did indeed ski on that hill often, although I never did. I was at college by then, in western MA, and was skiing mainly in Vermont. I remember Clear Hill clearly though (no pun intended -- actually we never called it Clear Hill. 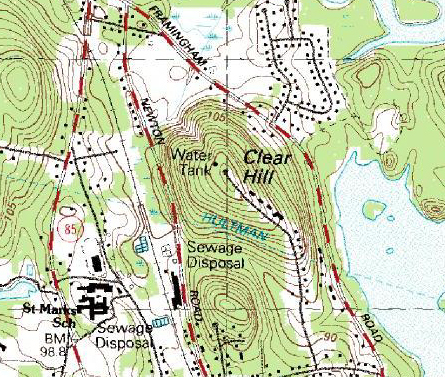 We knew it as St. Mark's hill); it was a decent hill, with a water tower on top, and a trail cut straight down the fall line (if you can call it that), with a rope tow going up the right side, through the trees. The hill was really active in good snow years (mid to late 60's in Worcester County). I don't remember if the hill was open to the public, or only for St. Mark's use." Richard P. Davisson: I helped put up the rope tow in '64 or '65. 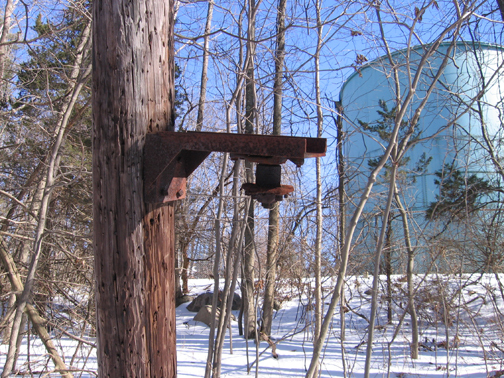 Mackin Pulsifer had welded a few tire rim spindles onto flanges that were bolted onto old phone poles to carry the rope back up the hill. There was some work involved in digging the holes and planting phone poles. I think there was an old Ford engine at the top to do the pulling. Don't remember what there was for a drive wheel except that it came in a special crate and was very heavy. Getting the rope off the reel was a challenge. We pushed the reel to the top and tied off the rope tail thinking - as only a bunch of adolescent boys could - that the reel would simply leave the rope on the hill and roll controllably down the hill. Well, the circumference of the reel being so much greater than that of the rope wound onto it, the reel kept grinding to a haul every few feet - usually canted to one side or the other. Since it wasn't a monstrous ski hill and some of us had no skis, we would sometimes use the hill with toboggans. There was a stone wall across the bottom that wasn't any good for the toboggans, but in real powder you couldn't see it "coming". So I remember counting carefully to measure how long it took to descend the hill. All well and good, but I failed to consider how much faster each successive run was down the same track. I learned one time when as front man for a load of five kids, I was carefully counting my last number before shouting "jump" when we crashed into the wall. So I yelled "jump" anyway as we dusted ourselves off for the next run - with another, sharper front man in place. I was also a student, and an avid downhill skier, at St Mark's from 1971 - 1975. 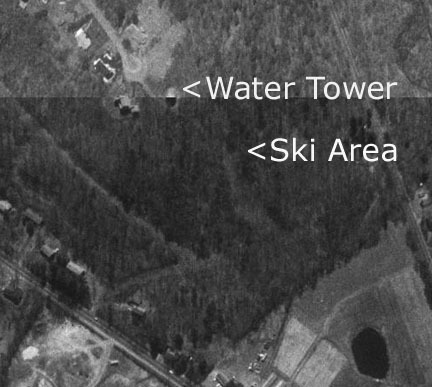 I can both assure you that the ski hill existed and that it never operated during the time I was there. I recall that there was some discussion of trying to restart it, but that never happened to my knowledge. I also recall, vaguely, that we may have only had one winter during that period which would have provided enough snow coverage to make it worthwhile. I could be fairly bold in those days, and I recall setting off one winter afternoon determined to figure out a way to make that rope tow work. The power box and controls were all quite obvious, and I immediately noticed that the main switch was off. "Well this will be easy," I thought -- as I pushed the lever up to the "On" position. The next thing I knew there was smoke and the most horrible smell coming from inside the box and/or machinery somewhere -- and I had enough sense to immediately shut it down. The smoking stopped, and a few moments later I probed around the mess to find a tangle of smoldering straw which had apparently been some small creature's nest. It was stinky and dank, and whatever remaining enthusiasm I had to get the thing working simply evaporated at that point. I do recall hearing that St Mark's had a ski team within several years before my arrival and that they had used Clear Hill to practice. To my eye, the rope tow was mid 50's to mid 60's vintage....so I am guessing that Clear Hill was most active in the 1960-67 period. 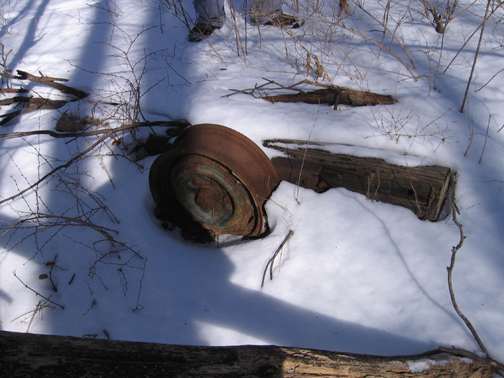 Thanks to Max Ziegler, who attends St. Marks and took the following photos during the winter of 2006-2007. Lift line for the rope tow. 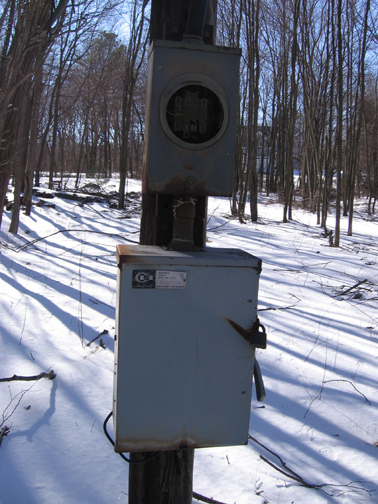 Power source for the rope tow. End of the rope tow. Note the water tower. Anybody attend St. Marks and remember skiing there? If so, let us know!